Sealaska Heritage Institute (SHI) has expanded its performing arts program for youth, Voices on the Land, to Yakutat and Ketchikan. Voices on the Land is an innovative program that teaches performing arts, digital storytelling, script-writing, story-telling techniques and the tools of the actor to improve literacy skills of students in grades 4-8. “For Tlingit, Haida and Tsimshian people, the arts—storytelling, dance, song, drama—are essential to who we are and our history. Schools tend to overlook the arts and offer few opportunities for inclusion of the traditional, cultural knowledge of the indigenous people of Southeast Alaska,” said SHI President Rosita Worl. Through the program, students will produce and perform plays based on traditional knowledge and stories; produce digital stories and sets of illustrated storybooks based on traditional knowledge, and produce a digital storytelling handbook for use in language arts classes for K-8 students. The program also provides training for elementary and secondary teachers on ways to integrate visual and performing arts into classrooms on a regular basis. 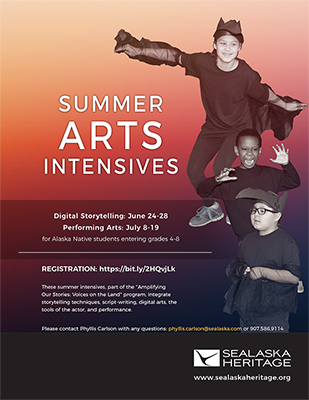 SHI also is currently recruiting Juneau School District students for summer day camps in digital storytelling and performing arts. The Voices on the Land project will also be supporting local youth camps in Ketchikan and Yakutat, and register will occur through those communities.